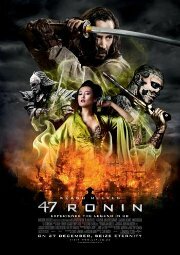 After a treacherous warlord kills their master and banishes their kind, 47 leaderless samurai vow to seek vengeance and restore honour to their people. Driven from their homes and dispersed across the land, this band of ''Ronin'' must seek the help of a half-breed they once rejected, as they fight their way across a savage world of mythic beasts, shape-shifting witchcraft and nasty terrors. As the exiled, enslaved outcast becomes their most deadly weapon, he transforms into a hero who inspires them. Despite the grand spectacle, initial professional reviews have been disappointing, while the popular vote has been positive. This film is releasing in both 2D and 3D, this is the 2D version.